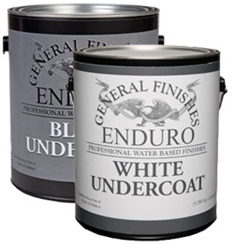 General Finishes Enduro UnderCoat is the ideal choice for a waterbased sealer and primer for MDF or other paint grade projects. Enduro UnderCoat is a high solids, quick drying sealer that builds fast and sands easily. Use it to more quickly seal and establish a base prior to further coats of Black, White or Off-White finishes such as General Finishes Tinted Polyurethane.